I was in need of picking up another gallon of distilled water at Wal-mart today, and decided to stop by a few more stores and do a quick evaluation of water purity of a few different brands. In addition, I wanted to better understand the importance of water quality and scale since there is no data on how water quality changes when run in a loop. I’ve read or heard a few people say that store bought distilled water just isn’t good or reliable enough and that you really need to buy ultra pure water. I have used regular distilled water in non-plated water cooling loops for years now and have even run tapwater in a loop for over a year now just for this nagging myth being spread about. Since I bought my own water purity meter, I now had the tools needed to see for myself and wanted to share my findings. I initially started testing both electrical conductivity as well as PH, but after a while realized that the PH was generally the same. It’s hard to measure with such little conductivity, but all the samples were within 6.5-7.5 PH which is neutral. The COM-100 meter is calibrated with a 1413 µS solution. The meter comes factory calibrated with a 1413 uS solution and appeared to be reading fairly accurately, so I proceeded to test with that factory calibration. Electrical conductivity or EC is a commonly used indicator to measure water purity. While conductivity itself isn’t the only measurement goal, total dissolved solids (TDS) in ppm (Parts per million) are also routinely converted from this number. To keep it simple, I’m just measuring the conductivity in this test and including a conversion table that was included with the meter to TDS if you are so inclined. Distilled waters typically should be better than 10uS where municipal water systems could be as high as 500-800uS. In water cooling we have had all sorts of numbers thrown out there with suggestions that grocery store distilled wasn’t good enough. In addition there was not any data in regards to how quickly this water becomes ionized in the loop which is important when considering the relevance of purity. Welcome to the another Raystorm test, this time the all metal premium Raystorm Copper block on my new 3930K processor. The Raystorm turned out to be an excellent performing block in both 2600K performance and restriction, yet there was only an acetal top with acrylic hold down version until now. The copper top is the same high performance design constructed out of more durable metal materials. I tend to personally favor the use of metal top blocks myself too, so when XSPC asked if I would be interested in reviewing a copper top, I was happy to accept. Before reviewing, I’d like to give special thanks to Paul from XSPC for sponsoring this sample product! allen key, and K2 thermal paste. Of special note is the CNC Cut “Copper” top and “Aluminum” bracket. The original Raystorm is made from plastic acetal/delrin and acrylic for the bracket (hold down). Welcome to my review of the Aqua Computer’s Flow Meter. While I have typically relied on my King Instruments analog flow meters for most of my test purposes, trying to fit a 14″ tall flow meter into your case isn’t very practical. For computers we need something smaller in size that can send an electronic signal to be processed digitally. 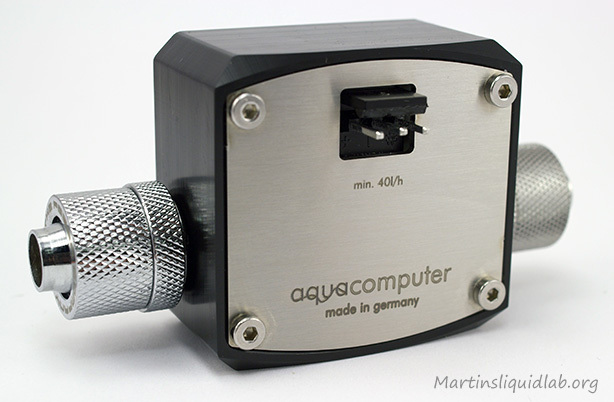 Aqua Computers has taken a popular and high quality Digmesa sensor and fabricated a new water cooling specific housing and flow chamber for it. We all like our G1/4 fittings and like a clean look which is the transformation that was done. I would like to thank Shoggy from Aqua Computer for this review sample that was included for Aquaero review, thanks! Clean Health Indicator – The tubes and blocks in your system are like veins and arteries in your body and can plug due to a variety of reasons. Plasticizers, flux, corrosion, and sedimentation of chemicals or some dyes can all be contributing chloresteral if you will. If you plan to keep the same loop operational for longer than 3-6 months, a precision flow meter can be a great piece of before and after information on yoru system and give you that indication that all is well without tearing everything down. Consider it a blood pressure cuff for your water cooling system. Emergency Shut Down – In the event that a pump fails to start, quit, or begin failing..a flow meter is one way to monitor that and shut down a system due to flow rates being too low. I have seen at least one DDC pump loose part of it’s circuitry yet it still operated. Complex Pump Setups & Parallel Loops – I have seen people connect up bay reservoirs incorrectly with two pumps in series such that only one was actually doing work. Both pumps were moving and water was moving in the reservoir, but they had no idea that allowing the reservoirs to be shared essentially eliminated all work by the first pump(no pressure differential). People are also beginning to experiment with parallel loop systems which can be an advantage but much more tricky to design properly when most parts out there don’t include basic restriction pressure drop info. While not likely, it is possible to build a parallel system that could be a pretty bad idea if the restriction levels are too unbalance. In parallel it is also possible to completely block one path of flow and not know it. Flow meters would again provide confirmation that things are operating as intended and continue that way. Testing/Tinkering – This is of coarse why I like them. While flow rate effects are generally small, I consider it taboo to test or review something thermally without also comparing restriction in some form or another. Even if it’s not for comparison and just for information, a meter completes the package of information that is easily collected for the end user to have and think about. I have used flow meters in the past for most of my testing work and have also used them for a couple of long term loops that I ran for over two years without cleaning, so I also see the health indicator being a value for me as I typically do like to push maintenance intervals to their maximum and generally only tear things down when upgrading. The specifications look promising in both flow rate sensitivity as well as voltage since an ordinary PC power supply also has 5VDC. Both specifications and compatibility are good. We’ll take a closer look at the package you get next.